The museum is easy to reach. We are a few hundred yards from King's Cross station, and an easy walk from St. Pancras International. King's Cross is one of London's biggest transport interchanges. There is good street signage using the standard brown signs. 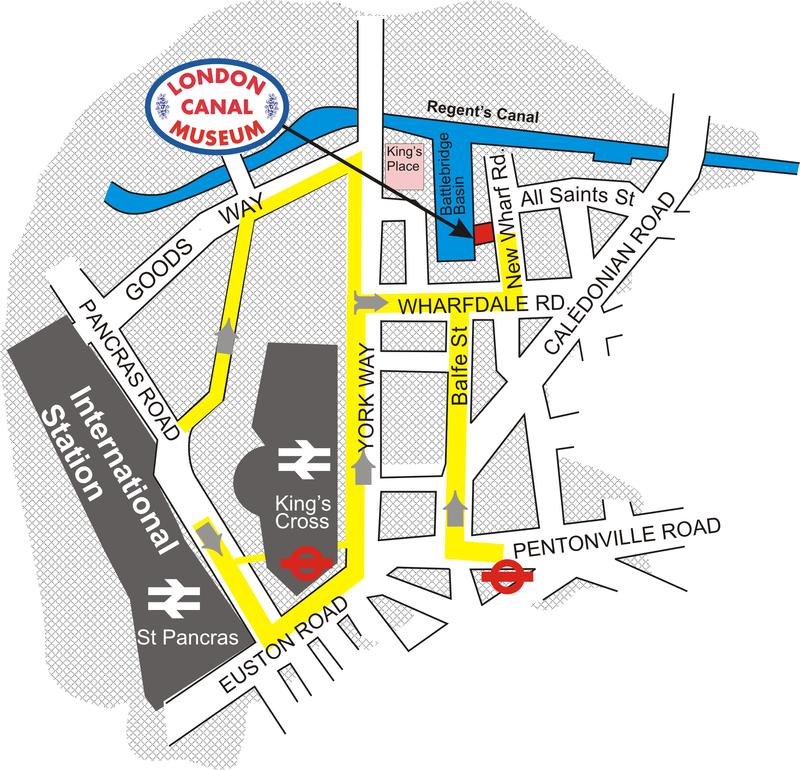 The routes from King's Cross main line and Underground, from St. Pancras International, and from the canal towpath are fully signed routes. We are in New Wharf Road. The postcode is N1 9RT. Exit at Caledonian Road (Thornhill Bridge) and follow the road to the south. Pass the pub Canal 125 on your right. Turn right into All Saints' Street and walk the full length of this street. At the end, turn left into New Wharf Road. For a detailed map from www.streetmap.co.uk click the link. Click the link for a more detailed printer friendly map and directions from King's Cross stations. From King's Cross Square, at the front of King's Cross mainline station, walk alongside the station, down York Way. This is the opposite side of the station to the concourse. You need to walk away from the concourse, past the arched front of the station to York Way, then turn left onto York Way. Carry on until you see a traffic island in the middle of the road with a right turn, this is Wharfdale Road. Follow Wharfdale Road until you see New Wharf Road which is the second turning on the left. The Museum is beside Battlebridge Basin, on the Regent's Canal. Turn left as you exit the station (east side) and cross Pancras Road alongside the German Gymnasium, a brick-built building with a pitched roof opposite the main entrance to St. Pancras International station. To the right of the German Gymnasium is King's Boulevard, which you follow to the end. It comes out on Goods Way, where you turn right. Walk to the end of Goods Way. At the end, turn right into York Way at King's Place, a large tall glass-clad building. Follow York Way until you come near to the station buildings of King's Cross station, then turn left into Wharfdale Road. Then take the second turning on the left, which is New Wharf Road, and you will come to the museum. Turn right as you exit from the station, in Pancras Way. Pass the great northern Hotel, then turn left into King's Cross Square in front of the main line station and follow the directions from King's Cross. Follow directions for King's Cross main line. DO NOT follow signs to "Regent's Canal". Exit to Euston Road. Exit the station turning left. You will come to a cross roads almost immediately, where you will turn right. You will need to cross two roads to do that. Follow Caledonian Road until you see a Tesco supermarket on your left. At the supermarket continue straight on along Balfe Street. This comes out on Wharfdale Road. Turn right there, and then look for New Wharf Road on the left. Note: This exit is not open at all times. From the station, follow the path down the slope to the main road and then turn left. Keep walking until you cross over the canal, then turn right into All Saints' Street. At the end of All Saints' Street turn left and you will have arrived.Allow about 15 minutes for this walk.